We’ve had a live Christmas tree almost every year–when I was a child and now as an adult. When we were kids in WV, we’d go to a nearby Christmas tree farm (I mean, a mile or so away) and pick out a tree. Now, in Western NC, the tree farms are higher up in the mountains so I settle for a pre-cut tree from a lot on the side of the road. But when Dad was young, they had real Appalachian Christmas trees. By this I mean my grandfather would go out and cut a tree in the woods. You know, a scraggly, scrawny tree with bare spots, a crooked trunk, and branches every which-a-way. Then he’d gather some extra branches, drill holes in the trunk (with a hand drill), and insert the spares to fill out the tree. What I wouldn’t give for a picture of one of those trees! The decorations were simpler, too, and Dad still has one of them–a paper cutout Santa Claus that he’s had since his first Christmas. While I don’t have any ornaments that have been around that long, I do have a handful from my childhood–mostly homemade. 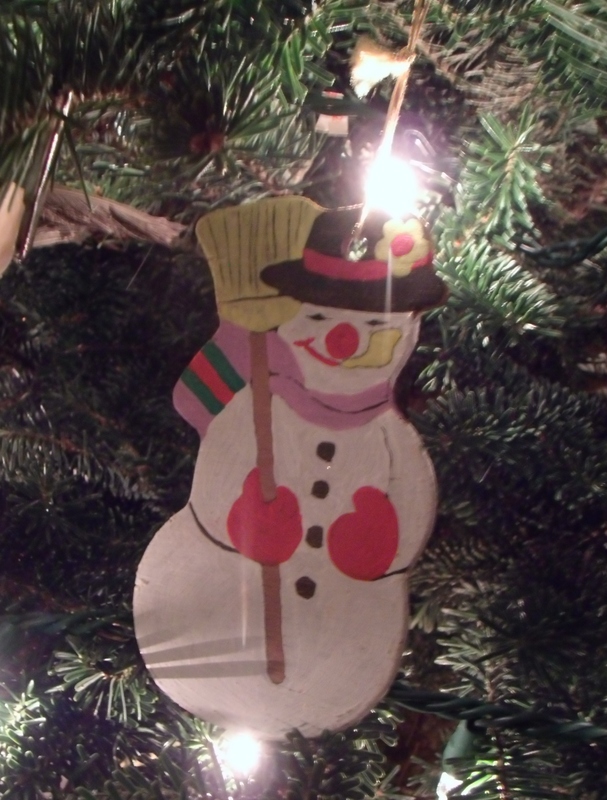 There’s a wooden snowman along with Mr. & Mrs. Claus ornaments Mom and Dad painted when they were first married. I also have the felt Mary with her Little Lamb sewn by my mother. I add to my ornaments each year, picking and choosing which to display as I unpack ornaments and remember . . . But none will ever be half so dear to me as the ones that carry me to Christmases past on the farm in West Virginia. We discovered our youngest was allergic to our live tree. Nothing like a middle of the night asthma scare to brighten the holidays. Plastic for us! Eek! That takes the romance right out!